“Life, Liberty and the pursuit of Happiness“ wrote Virginia delegate Thomas Jefferson. Jefferson was chosen to write the Declaration of Independence because he had a reputation as a ‘masterly pen’. The fifty-six men who signed the Declaration CHANGED THE WORLD! 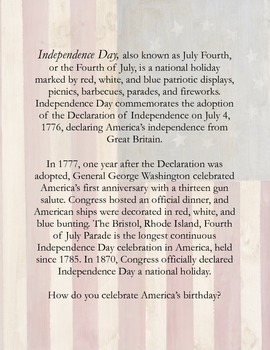 Use this lesson plan to learn about and teach the true meaning behind the Fourth of July. Informational text worksheets include: characters, plot, setting, character traits, themes, cause/effect, conflict/resolution, response to text, and summarizing. 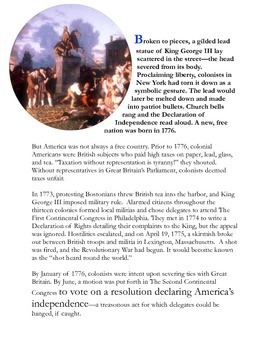 Based on an article about the Declaration of Independence, this 28 page packet includes an article, ready to print student worksheets with answers, Declaration of Independence facts, Write like a Revolutionary activity, vocabulary sheet, Independence Day facts, extension activities, related web sites and teacher instructions. 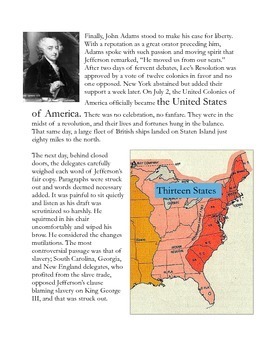 A good resource for 5th through 10th grades and all American History Enthusiasts! This product should be used by the purchaser only. Copying or sharing with othersf is prohibited. This product may not be displayed for public view. Permission is granted to copy for single use only. Electronic distribution is limited to single use only. This product is not for public display on school web sites, blogs or other web sites, and not to be shared at teacher workshops or conventions. A multiple user license is available at a discounted price. 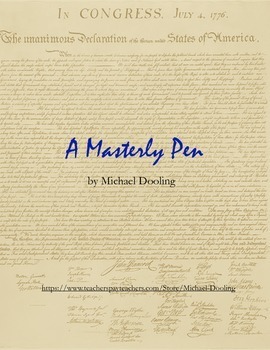 Copyright Michael Dooling All rights reserved by Michael Dooling. Not complying is a copyright infringement and a violation of the Digital Millennium Copyright Act. Thank you for your consideration and please look for my upcoming products about people who have changed the world. If you like to be notified when I post new products, or make modifications to them, please follow me by clicking on the green star below my name.